There is nothing better at the end of a long day at work than coming home and kicking back in a comfortable recliner. Now finding one that is able to properly accommodate both your budget and your body can be quite a daunting task. Recliners can range in price from $250 to an astounding $5,000….and the thought of cost is far from relaxing. But, when you consider the fact that a quality recliner should have a lifespan of a minimum of a decade, does calm the nerves a bit. The following will guide you through how to get the most for your money while creating your own oasis within your home. 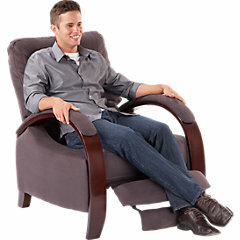 Should you find yourself desiring a rocker recliner, think La-Z-Boy. Keep in mind that although the base pricing is set in the neighborhood of $350, a well-built model will actually cost you upwards of $600. An option that is a bit trendier is that of a space and style conscious push back model recliner. This type tends to cost an average of $250, but they do not last as long as their more traditional counterparts. This is due to the lack of levers and the mechanism itself getting more of a workout as compared to other types of recliners. There are a number of specialty recliners that are electric and include massaging features. Electric recliners are designed to assist those with mobility issues, while those hosting massing features tend to be quite expensive ranging from $800 to $5,000. Regardless of the type that you are choosing, while shopping, ensure that there is no more than a 5 inch gap between the open leg rest and the seat. This will prevent the occurrence of a pet or a child becoming trapped and/or injured. The same rule of thumb should be attributed to the lever so that smaller fingers do not find themselves trapped within or pinched in any manner. Do my feet touch the floor when sitting upright? Are my neck and head properly supported by the headrest? Is the cushioning ample and comfortable? Additionally, you will need to inspect the recliner for any bumpy parts within its back and seat. The foam density that you should look for is 1.9 or greater, this will allow for the shape to be kept longer. Most standard furniture cushions range from 0.9 to 2.5 density rating. You will also need to test the footrest of the recliner several times as a measure of ensuring the ease of its maneuverability. Also, listen closely for squeaking that will prove as an indication of either an improper alignment or loose parts. Recliners that have been upholstered in leather are by far the most durable, but they are also the most expensive. They tend to traditionally carry a price tag of $1,000 and up. Should you prefer the look and feel of suede, it is best to opt for a synthetic microfiber due to its ability to resist wrinkling and moisture and price range of $500 to $1,000. It is also imperative to inquire as to how many times a sample of your chosen fabric has been machine tested for durability. You will want to choose a fabric that has been tested a minimum of 10,000 times. Be wary of recliners that have been upholstered in vinyl. It has the ability to crack and has been found to be far less pliable than other fabric options. The top fabric choice for the furniture option is that of wool due to its ability to be naturally stain resistant as well as long wearing. You will need to note that for this option, the pricing begins at $1,200. According to a number of experts within the repair industry, the non-moving components of a recliner tend to break. Therefore, you will need to thoroughly inspect the underside of the chair, if possible. If it is not plausible, ask to see pictures, videos of a sample of the cutaways from the recliner’s manufacturer. You will want to be able to notice heavy duty screws not plastic fasteners or dinky screws. Hardwoods such as poplar and birch are optimal and will cost approximately $1,000. Plywood is a decent second choice and will cost a minimum of $300. ALWAYS check the guarantee that is offered by the manufacturer and choose one that offers a span of at least 3 years. Previous ArticleHave You Ever Wondered What The Most Expensive Recliner Is?